ACCORDI, DISEGNO DELLA TASTIERA, PENTAGRAMMA. Ciò che serve per studiare ed insegnare. Questo libro nasce da una mia esigenza condivisa da chi studia o insegna la chitarra: avere a disposizione in un solo testo la maggior parte degli elementi con cui impostare il lavoro didattico. Più che un metodo dove il lavoro da svolgere è già piano, questo è un contenitore dal quale attingere informazioni che possono essere utili per un corso di studi; il materiale fornito può essere modellato dall’insegnante secondo il suo personale metodo e offre all’autodidatta le cognizioni e i mezzi per rarsi nell’esplorazione musicale. Il libro è diviso in più parti: una teorica, dove gli argomenti vengono spiegati nella loro essenza, una sorta di dizionario musicale selezionato che permette la comprensione degli argomenti in cui ci si imbatte nellio del jazz e della musica moderna. La seconda parte illustra graficamente le diteggiature di scale, arpeggi, accordi etc. Questa è la zona degli attrezzi di lavoro, costituita da grafici e diagrammi. inserimento dell'accordo di dominante, . inserimento delll m7 applicato al tritono, . cambio di specie applicato al tritono, . II / V / I songs (brani tonali), . scrittura e simboli delle sigle, . triadi per accordo di dominante, . arpeggi per accordo di dominante, . triadi utilizzabili sui modi della scala maggiore, . arpeggi utilizzabili sui modi della scala maggiore . intervalli, tonica sulla sesta corda, . intervalli, tonica sulla quinta corda, . intervalli, tonica sulla quarta corda, . scala maggiore posizioni base, . scala minore armonica posizioni base, . scala minore melodica posizioni base, . scala maggiore posizioni verticali, . scala minore armonica posizioni verticali, . scala minore melodica posizioni verticali, . accordi di settima drop 2, .
accordi di settima drop 3, .
accordi di settima senza quinta, . sviluppo degli accordi di settima sui modi della scala maggiore, . sviluppo degli accordi con intervalli di seconda sui modi della scala minore armonica, ..
sviluppo degli accordi con intervalli di seconda sui modi della scala minore melodica, ..
esempi di accordi con tensioni . esempio su Autumn Leaves . Esempio su autmn Leaves . 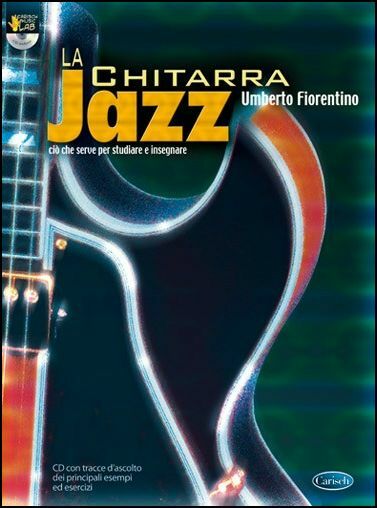 del jazz e della musica moderna. La seconda parte illustra graficamente le diteggiature di scale, arpeggi, accordi etc. Questa è la zona degli "attrezzi di lavoro" costituita da grafici e diagrammi. 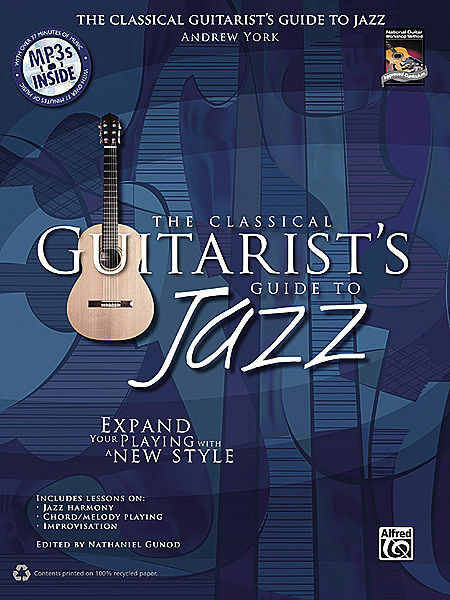 YORK ANDREW, THE CLASSICAL GUITARIST'S GUIDE TO JAZZ, Expand Your Playing with a New Style. Guitarist and composer Andrew York presents the ultimate guide to jazz for classical guitarists. 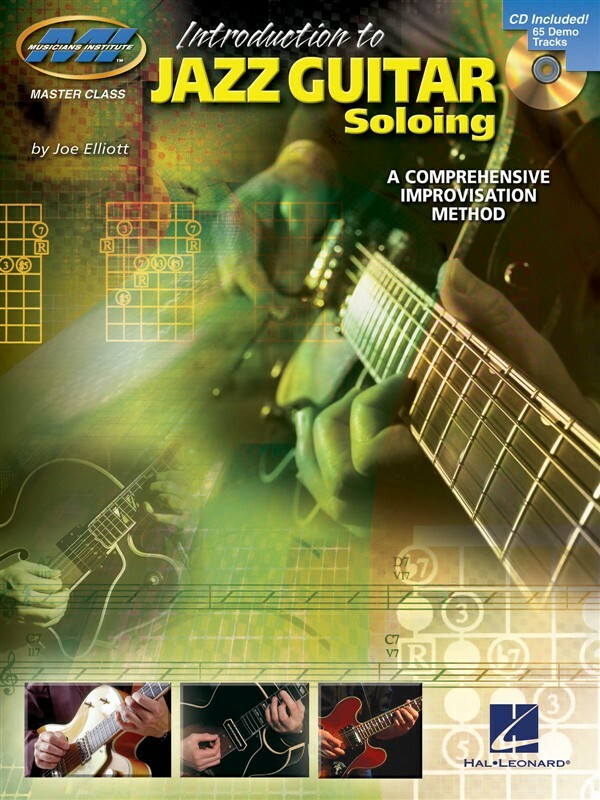 The first two sections of this three-part book cover jazz harmony and chord/melody, focusing on comping, chord voicings, voice leading, and arranging for solo guitar. Part three looks at improvisation, which may be the most exciting—yet foreign—aspect of jazz for classical guitarists. York shows you that improvisation is a skill that can be learned and practiced just like any other. By practicing the ear training and visualization exercises in this book, you will learn how to turn the music you hear in your "mind's ear" into imaginative, great-sounding jazz solos. The CD contains the exercises and examples performed by the author. have some fun doing it. with scalesor modes can be learned effectively, it's vital to have a solid grasp of jazz harmony. Sothat is where I chose to begin. didn't want to spoon-feed you. Getting the most out of this book will require your participation and study. Most of all, I hope you find some inspiring new directions for your music. Enjoy. never been drawn with a heavy line; we have always encouraged as much "cross-fertilization"
course designed to teachjazz guitar to classical guitarists. you, you may want to brush up a bit. in music making-music of all kinds-among our fellow guitarists. it, both chords and melody. .
multiple harmonic settings of melodies. diagram boxes for help with visualization of chord shapes. I hope you enjoy this book and learn a lot. e able to use this section as ajumping-off point and enjoy a lifetime of music-making in this st'le. s fun, and having this set of skills will help working guitarists fill out their sets on the gig. labeled "MP3 Files" to view the files and copy them to your hard drive. CHAPTER ELEVEN – Blues for J.D. Romanza with Chord Changes . spontaneity and creativity on your guitar. Voicings for "Fly Me Through the Tune"
POWERS LEIGH, THE SCALE BOOK. HOLDSWORTH ALLAN, MELODY CHORDS FOR GUITAR. ARPEGGIOS. CHERRY. 215 Pagine, centinaia di arpeggi a 1, 2, e 3 ottave, diagrammi, teoria, formule. TAB. 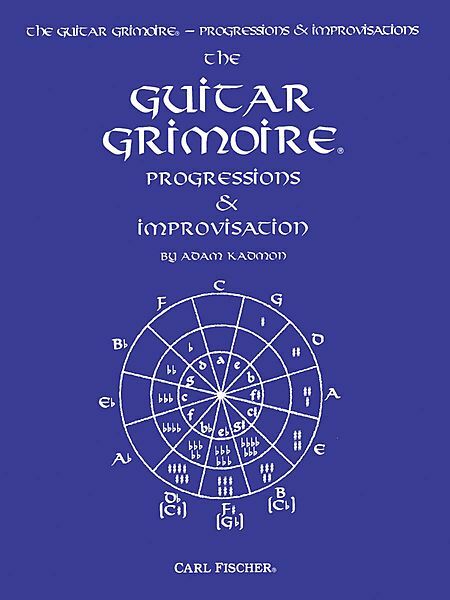 Guitar Grimoire, The-Progressions & Improvisation by Adam Kadmon. For Guitar. 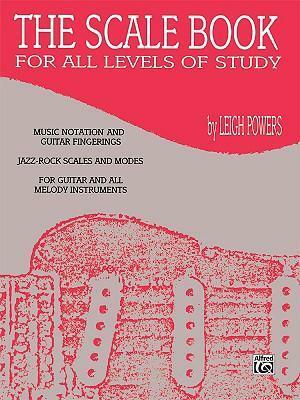 This long awaited volume is the most thorougly exhaustive compendium of chord progressions ever published. Literally filled with hundreds of exercises and thousands of diagrams accompanied by Kadman's unique presentation, this book completely examines the. Instructional, Improvisation and Progressions. Instructional book. Standard notation. 282 pages. Published by Carl Fischer (CF.GT15). SERIOUS ELECTRIC BASS, The Bass Player's Complete Guide to Scales and Chords By Joel Di Bartolo. SERIOUS ELECTRIC BASS, The Bass Player's Complete Guide to Scales and Chords By Joel Di Bartolo. TAB. Bass basics, major scales and modes, harmonic and melodic minor scales and modes, arpeggio patterns and symmetric scales (whole tone and diminished). 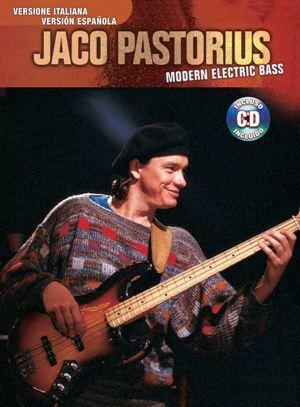 Serious Electric Bass is a definitive, comprehensive, user-friendly guide for electric bassists of all levels. 279 pages. the octave on any string (the upper register) are a bit harder to play than those below the octave. Adjusting the tilt of the neck should solve the problem. you bolt-on neck owners, this adjustment may be done in one of two ways. feature usually have three rather than four screws holding the neck onto the body. screws two or three full turns. the wrench another one-half turn and you should see the neck raise slightly. see if the problem has been solved. If not, repeat the procedure. the bass. When removing the neck, just turn the screws far enough to get the neck off. cover in the bottom of the neck slot. good 'our job is done. this procedure to each string, each string should be fairly well in tune with itself. until the notes match at both points on the neck. either case, try to find an average between the two, and move on to the next string. of the fingerboard, but it will also benefit your low strings a lot. problem, allowing you to play notes high up on low strings that sound clear and well-centered. sure how to do it. The Fender-style bridge is the most common one on the market. N.B. 4: This section is pretty involved. Be sure you understand all of it before moving ahead. Perfect for seasoned rockers seeking new challenges and jazz newcomers looking for a good start, this book/CD pack covers scales, chords, licks, techniques and other vital jazz improv concepts step by step. The accompanying CD features 65 full-band demo and play-along tracks. Whether you're a seasoned rocker seeking a new challenge or a jazz newcomer looking for a good start, this book and CD pack will provide the vital concepts you need to begin your journey into jazz improvisation. Includes loads of step-by-step information, scales, licks, and techniques, plus the accompanying audio CD features 65 full-band demo and play-along tracks! If you're like me, your first experience playing a guitar solo was in your friend's basement or garage. You probably learned the A minor pentatonic scale in fifth position, learned a few repetitive "didlee-diddies," a couple of bends, and had a great time jammin'. When I figured out what key a song was in, I would move my minor pentatonic shape, didlee-diddles, and bends to the place on the neck that seemed to fit and-jam. The soloist in me didn't really seem to care that I didn't know too much. Well, this was how I played for quite some time. I gradually expanded my knowledge by learning more patterns of minor and major pentatonic scales. I played with this amount of scale knowledge until I got into college and was introduced to some jazz guys. Playing tunes with them, I continued this basic approach but had to adapt to the songs changing keys more often. My solo approach, however, was still basically the same: figure out the key and wander around the pattern hoping I'd get lucky and play something good. This is called key center soloing, and there is nothing wrong with it. It's a wonderful way for us to break into the world of soloing early on in our musical development. It's great that we guitarists can learn to make good music with a small amount of information. But I knew there had to be more. Most guitarists live in this stage of development for a long time with a growing sense that they are missing some important element that would make them sound better. They're right. What's missing is the knowledge of how to make your solo fit the chords the band is playing. How do the great players pick those great notes in their solos? Some people might refer to these notes as "sweet notes," but they are really just chord tones. Chord tones are simply the notes of the chord that the band is playing. This very simple concept, which is called chord tone soloing, is the basis for the technical side of playing jazz. The vehicle for playing chord tones is the arpeggio. Understanding the concept is simple; implementing it requires some special and organized efforts. 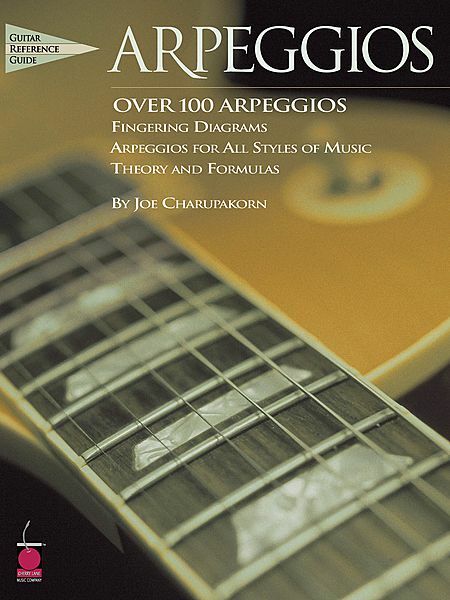 This book is designed to do just that: organize and gradually build your fretboard knowledge to a level where chord tone playing becomes as natural as wandering around the minor pentatonic scale. This book is based on the jazz improvisation method I've taught at G.I.T. since 1988. It works for the seasoned rocker who is ready for a new challenge or the jazz newcomer looking for a good start. The essence of the book can be summarized by the following statement. STAND ALONE TRACKS: FUSION. M. Dziuba. CD TAB. This is the most effective practice tool you will ever use! With Stand Alone Tracks, your CD player becomes your own personal back-up band. This Book and CD set will help you make the most of your practice time and polish your improvisational skills. Examples range from simple to complex in a variety of possibilities within the style. Examples are long enough to let you really "stretch out" and experiment as your chops develop.